Skilogik’s Yeti Skis have received top honours and a ‘Gear of the Year” designation from the Backcountry Skiing Canada test team. This is a lightweight, dedicated-backcountry ski that not only looks beautiful but can tame the terrain in bounds and out. And they’re a great conversation piece. Congrats to Skilogik! Two schools of thought have emerged within the ski industry over the past decade: light is right versus the more free ride rugged mentality. Both options have pros and cons, but personally I am a "light is right" kind of guy given that I am slightly beaten up and every additional gram adds another ache to each step on a ski tour. Enter the Skilogik Yeti skis. These skis were designed with the backcountry skier in mind; plenty fat for the pow while still tipping the scales on the lighter side of things. Weighing in at 3300 grams per pair and at 105cm underfoot the Yetis are one of the lightest fat skis on the market - just what I was looking for! As a concrete example of the weight savings, my previous dedicated backcountry setup weighted well over 5 kilos per pair. When mounted with Plum Guide bindings the Yetis weighed in at only 4 kilos. This is a huge weight savings that you can feel with every step. The Skilogik Yeti only comes in a 183cm length, which is the perfect length for my six foot frame. They have a huge amount of camber under foot to allow for both quick linked turns as well as long radius ones. A flat tail with a skin clip notch is designed for plunging and anchor building on mountain ascents and further cements the Skilogik Yeti as a true backcountry ski touring ski. Their thin profile provides a soft flex with plenty of give and pop to make these ideal for ski touring and as a resort crossover ski. 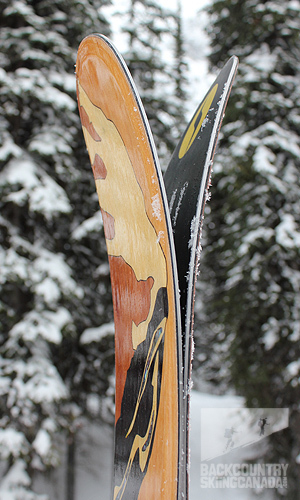 Did we mention that these are the most beautiful skis out there? Not a ski tour goes by without someone commenting on the looks of the ski and their artistic top sheet. 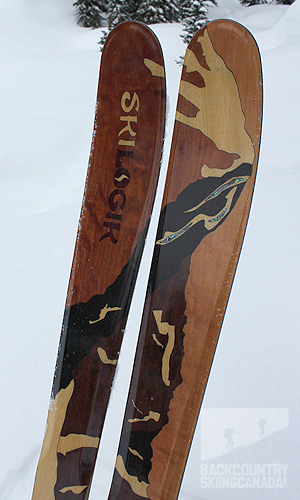 David and Mariella Mazzarella founded Skilogik a few years back and the skis have been gaining quite a bit of attention due to their unique and beautiful appearance. Mariella is the artist who designs each top sheet and decides which wood veneer (yup, that’s all wood no stain or paint) will be used to achieve the desired outcome. David moved his family to Hainan Island, China, and set up a factory which uses some of the best practices in manufacturing production and sustainability. On the manufacturing side, David pays his workers above market rate to attract and retain qualified employees. 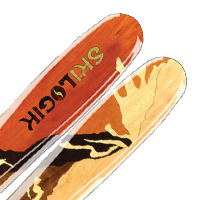 On the materials side, 95% of the wood used to create Skilogik skis is sustainably harvested and all of the black locust wood comes from family farmers who plant these trees as a natural nitrogen-fixer to reduce the need for chemical fertilizers. Skilogik also follows the philosophy of "Make skis, plant trees", meaning that they plant a new tree for every pair of skis they manufacture. From humble beginnings Skilogik now offers 18 ski models in 7 categories all of which carry their distinctive top sheet design and construction and if you cannot find something you like then you may want to commission your very own top sheet and let your artistic expression shine. 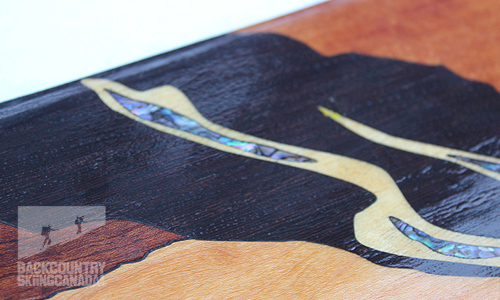 The top sheet is a work of art with wood inlay. 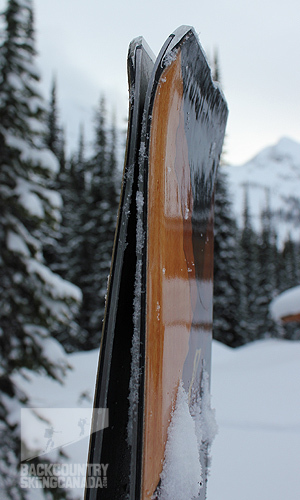 So we know that the Skilogik Yeti are a beautiful ski, but is beauty only skin deep? Let’s look at the layers in the sandwich construction. Starting at the outer most layer there is a "Clear Iron" finish to protect the top sheet, next a wood veneer inlay to make them beautiful, continuing there is a "Vektor 8" composite layer to provide torsional rigidity, Black Locust sidewalls for stiffness, Hardwood Core for more rigidity, "Bomb Proof Edges", Vulcanized Rubber to control vibration and finally a "Black Magik" base. So what are all these fancy terms and what do they mean? 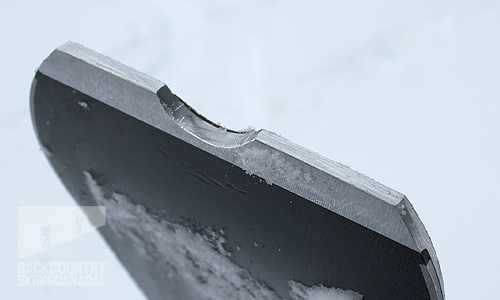 The Skilogik Yeti uses a proprietary technology called "Vector 8 carbon fibre construction". Simply put, this means carbon fibres are arranged to radiate in 8 directions which provides torsional rigidity without heaps of weight. 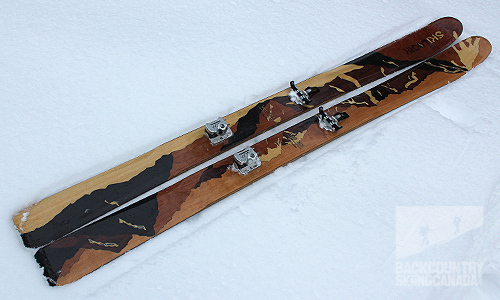 Vector 8 is a combination of carbon fibre and fibreglass and is placed in the ski above and below the hardwood core. The Black Locust we talked about above is a very hard wood which provides the stiffness needed in a sidewall for a clean carving turn. 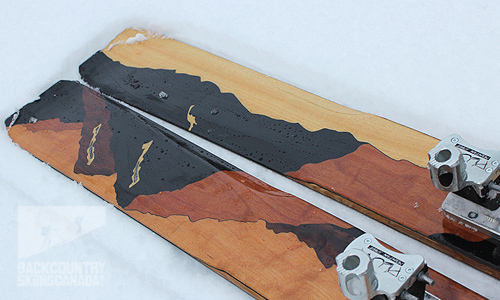 It is also naturally waterproof and has anti-rotting properties, making it a great material for ski construction. The finishing touch on the Yetis is the "Black Magik" base which has added graphite to make this the hardest sintered base material on the market which also has great glide properties. Flat tail design for anchors with metal tail bumber and skin clip notch. Plenty of side cut and camber allows for fast turn initiation while their thin profile keeps them light. We mounted the Skilogik Yeti Skis with the Plum Guide Bindings which are a light weight tech binding made of aerospace grade aluminum material. The heel piece of the Plum Guide Binding can be rotated in both directions to achieve the desired heel lift. There's also a 15mm distance between the ski boot and the top of the ski which allows for a natural flex and eliminates the 'dead spot' between the toe and heel piece. The mounting pattern of the Plum Guide Bindings is 100% identical to the (non race) Dynafit touring bindings so no need to re-drill those skis if you are looking to change brands, easy-peasy. The Plum Guide bindings retail for $620 CAN and weight in at 22.65 oz / 670g (per set w/o screws), the DIN range is from 5.5 to 12. This is the second pair of Skilogik skis that we have reviewed in as many years, the first being the Skilogik Howitzers. Skilogik has expanded their line-up to now include skis for almost every type of skier with two offerings for the dedicated backcountry skier: the Piton and the Yeti. The Skilogik Piton is the narrower and lighter cousin to the new Yeti. At 105mm underfoot the Yeti has sufficient girth to give you float in the deep stuff while not being so fat so that they're slow to get up on edge. For a fat ski the Skilogik Yeti is still at the top of the light weight ski chart at just 3300 grams per pair. As with the Skilogik Howitzers we again mounted the Skilogik Yeti skis with a pair of Plum Guide tech bindings in order to keep them super light. The Yeti/Guide combo saved us 680 grams per pair when compared to the Howitzer/Guide set up. This brings the total weight for the skis in at 4000 grams, that’s light! Weight savings were not the only thing that made this skier smile, I also like the tail notch for keeping my skins in place (a major pet peeve of mine). I have already gushed enough about the virtues of the Yeti's top sheet design so I'll stop that one right there. On the skiability side of things, the Yeti are made for backcountry skiing, period. Light, fat, camber, side cut, and early rise tip - need I say more? Their thin profile (and hence light weight) provides a soft flex with plenty of give but be sure to stay on top of them in adverse conditions or they’ll definately throw you around. The Skilogik Yetis are a blast to ski, great fun to carve as they have plenty of 'pop' and provide easy turn initiation thanks to all that camber. 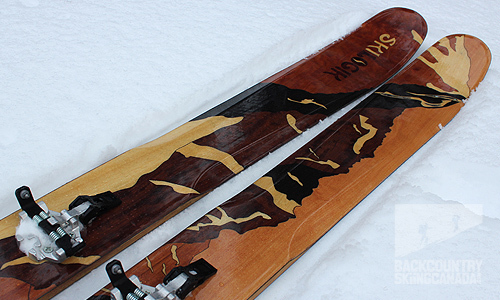 David Mazzerella has created a fun backcountry ski that carves and floats and Mariella has made it a work of art. Have a look at the other Skilogik reviews we have prepared including the Skilogik Howitzer Skis, the Skilogik Piton Skis and the Skilogik Ullr’s Chariot BC Skis. 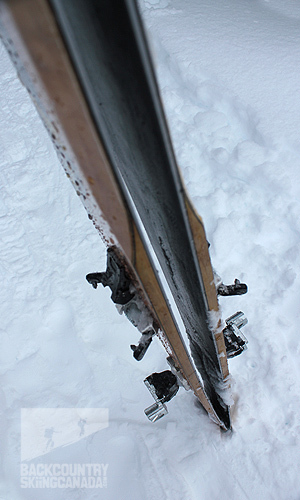 A very light ski for backcountry skiing that is fun and stable in the pow. Great looking top sheet and ski design with bevelled edges and tail notch for your skin clip. Exposed wood sidewalls need additional care. Hard to shred on such a beautiful ski, it should hang on the wall. Only one length available.